This book is an edited volume of case studies exploring the knowledge-engagement efforts on water governance in the Mekong region. It is the fourth volume in the M-POWER book series. Download book flyer Governing Mekong Flyer_with TOC. The US$3.5 billion (107 billion baht) Xayaburi Dam along the Lower Mekong, if built, would irreversibly change the ecology of the Mekong River, and threaten the fisheries and food security of millions of people in the Mekong region and beyond. The first of a planned series of mainstream dams on the Mekong River, the dam is a joint development between the Government of Laos (GoL) and Thailand’s construction company Ch. Karnchang. Thailand’s Electricity Generating Authority of Thailand (EGAT) has agreed to purchase 1,220 MW of electricity at a cost of 2.159 Baht per kilowatt-hour. The Finnish Pöyry PLC (Publicly Listed Company) and its subsidiary Poyry Energy AG, one of the leading international consultant firms is involved as a consultant hired to do the impact assessment. Poyry has portrayed itself as a pioneer of green and sustainable economy with a slogan “Preparing the Plant”. Although the social and ecological impacts of the dam could be huge and extending all the way to the Vietnam delta, the information and decision-making process appears less than transparent and the centralized energy-planning model is a point of controversy. Even before discussions went underway, Laos had started extensive construction work in preparation for building the dam. For instance, the Pöyry study gave the green light for the project. But the Mekong River Commission (MRC) panel of experts declared in their Strategic Environmental Assessment (SEA) that the dam would disrupt the flow and likely affect fish habitats and life cycles. More than 200 species are found in this part of the river and the catch is estimated at 40,000 to 60,000 tonnes per year. The SEA panel specifically recommended that a “10-year deferral be placed for mainstream hydropower development … to ensure that the necessary conditions to strengthen understanding of the natural systems as well as management and regulatory processes are conducted effectively”. 3) examine the international global linkages (Laos-Thailand-Finland) and the role and responsibilities of international actors such as consultant companies. 1) How transparent is the decision-making over the dam? What kinds of information are used to justify (consultants reports) and what is being missed (perspectives of fishers and others dependent on the river). 2) Is this dam necessary for electricity; whom does the hydropower benefit? Do Thailand’s existing energy plans mostly serve the interests of the state-owned electricity utility, energy companies, and the construction industry, rather than the needs of the regions’ electricity consumers? 3) What is the role and responsibilities of international actors/global linkages such as consultant companies in the region? For example: Pöyry is a company of significant national importance to Finland and it has portrayed itself as the pioneer of green and sustainable economy. How does this image match with its role in the Mekong dam projects (Xayaburi also Nam Ngum 2 and Yali)? 4) How sound is the energy planning of EGAT (Thailand) and Laos? Is EGAT’s energy planning part of the problem as it heavily promotes the development of new large-scale electricity generation plants, such as fossil-fuel fired power stations and hydropower dams, increasingly locking Thailand and the region into a “centralized electricity supply model”. 5) The impacts of the dam on the Mekong fisheries and the importance of capture fish to the people in the region. Documentary (DVD), 47 min., in English w. subtitles in four Mekong region languages, 2011. For about a year from mid-2010 to early 2011, my friend Carl Middleton and I travelled across the countries of the Mekong region with a video camera. Our objective was to film the extraordinary fish biodiversity of the Mekong River and its ecosystems not only through the eyes of the fishers who depend on the fishing but also those who make their livelihoods from selling and processing as well as those who cook and eat the fish as part of their daily meals. We filmed fishers and fish sellers near rivers, streams, canals and wetlands, and talked to them about their relationship to the river, its fish and to markets near and far. We marvelled at the incredible number of ways that the fish catch is processed: fermented, smoked or dried, salted or marinated in spices. We ate many kinds of fish preparations in homes, markets and restaurants and talked to cooks and chefs and fish sellers about their favourite recipes and fish dishes. A film about how the plentiful fisheries of the Mekong River and its tributary ecosystems provides a web of connections across livelihoods, food and culture in the Mekong region and beyond. A healthy Mekong River is central to mainland Southeast Asia’s food security. The rich fisheries and ecosystems of the Mekong River not only feed people living alongside the river but are crucial for the livelihoods of millions of people across mainland Southeast Asia. 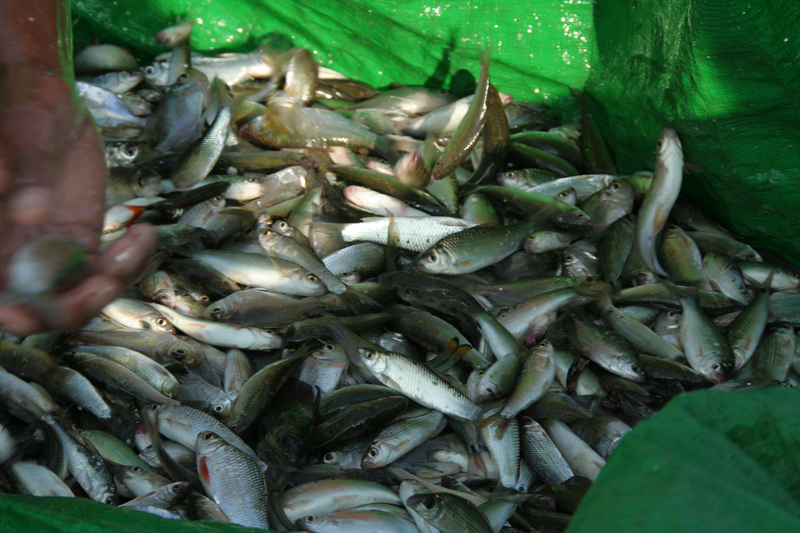 The film shows how the fish from the Mekong River and its tributaries are caught and sold, cooked and consumed, by the people in the Mekong region. Caught using an array of nets, baskets and traps, and cooked in many amazing ways, the wild fish catch provides protein and essential nutrients. 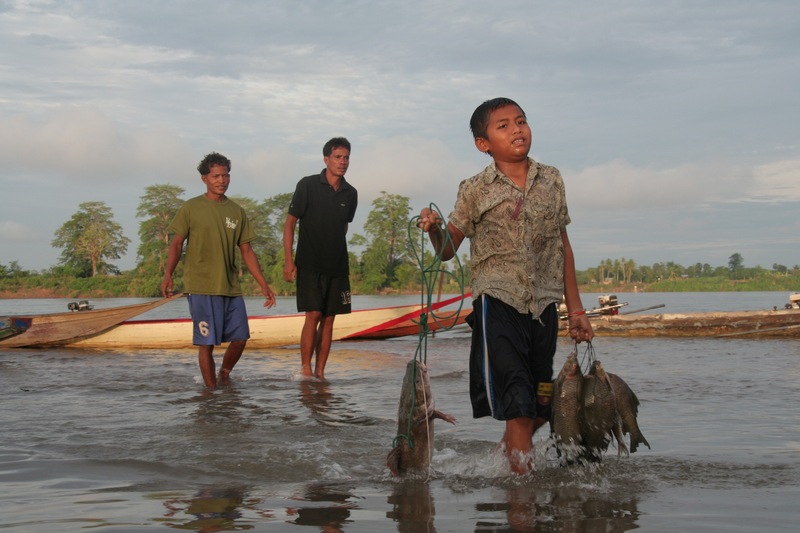 Yet, the interconnection between the Mekong River’s well-being and the fish on a family’s plate is not so apparent in the urban centers. The film shows the Mekong River’s wild fish being caught and processed, and its passage through networks of trade as people work through the night and day to transport the catch to villages and towns, to markets, homes and restaurants (read more). Filmed in over 30 locations across the Mekong region from Cambodia and Laos to Thailand and Vietnam. Available for onscreen viewing at: http://www.cultureunplugged.com/documentary/watch-online/play/7225/The-Mekong—Grounds-of-Plenty. “Siirretyt (Displaced)” film festival organized by the Siemenpuu Foundation on 10-12 October 2011. Lifescapes Southeast Asian Film Festival in Chiang Mai on 2-5 February 2012. Explorations on using video for improving research and communication in resource governance by Rajesh Daniel. Paper presented at the panel session on Filmed Ecologies: Possibilities and Challenges in Environmental Communication at the 11th International Conference on Thai Studies – Visions of the Future, held in Siam City Hotel, Bangkok, Thailand on July 26-28, 2011. Upland watersheds in northern Thailand are arenas of social interaction and political contestation around the values, uses and management of natural resources and ecosystem services. Differences in definitions, perceptions, objectives and interests among actors abound and often lead to misunderstandings and misrepresentation of alternative land-use and watershed management practices (Luangaramsri, 1999). Tensions in these arenas have grown in recent years with intensification of land-uses and market-oriented cultivation in both upland and downstream areas. Upland farms now widely use fertilizers and pesticides and in some locations even have overhead-sprinklers and associated infrastructure for irrigation water storage, delivery, and distribution (Badenoch and Wanitpradit, 2006). The nature of the governance challenges are not dissimilar to many upland forest areas in the countries of the Mekong region as national parks and watershed conservation areas expand while upland farmers try to maintain their livelihood security and resource use. This chapter explores how upland farmers in northern Thailand, predominantly ethnic communities, are using local-level institutions to manage not only resource scarcity such as seasonal water shortages but also resource constraints posed by state conservation laws and official development strategies. The local politics of watershed management in northern Thailand is affected by wider watershed management discourses, government policies related to the uplands, in particular regulations and classification systems for land, and the feedbacks from actual livelihood and conservation practices. Based on the authors’ research in the Upper Mae Hae and Khun Kan watershed areas, the chapter shows that upland farmers attempt to maintain farming livelihoods by using and adopting a range of local institutions such as traditional definitions and practices as well as local government agencies. Individual actors are seen taking on greater responsibilities and roles with respect to local institutions for watershed management. Upland farmers attempt to frame their own definitions of “watershed” based on their cultural or customary values, transform earlier village-level institutions (Wanitpradit, 2005), drive collaboration among individual actors in positions of power, or redefine other new institutional set-ups from activities of several actors to retain control over livelihoods and upland landscapes (Prasit et al, 2006; Lebel et al, 2006). The chapter uses case studies in the Upper Mae Hae and Khun Kan watersheds in northern Thailand to illustrate the negotiation and contestation between the different definitions and meanings of watershed and those who use it. The cases show the on-ground efforts of local-level actors including individual leadership, watershed networks that cut across administrative boundaries, and the local administrative organisation play their roles, shape their definitions and perspectives as well as further their diverse objectives in watershed management. We think that the policy challenge for watershed governance in Thailand and the Mekong region is to provide an enabling policy framework that can be inclusive of upland—especially ethnic community—livelihoods, address resource access and scarcity, and resolve resource conflicts and tensions. This chapter is an attempt to further our understanding of upland watershed management and the roles of local institutions in order to widen the options for watershed governance policies in Thailand and the Mekong region. The chapter is structured with the following sections: outline of the key contestations over upland watersheds in Thailand including how watershed as a concept is constructed; the different ways of viewing the watershed; case studies illustrating the local institutions and watershed management practices, and; discussions and conclusions. Book chapter in: Lazarus K., Resurreccion B., Dao N., and Badenoch N. (Eds.) 2011. Rites of Access: Seeking Justice in Managing Mekong Region Waters. Earthscan, London. Vol 3 of the M-POWER book series. A changed climate is already here as the world faces threats of disaster from more frequent and intense cyclones, heavy rainfall events, sea-level rise, and warmer temperatures with adverse effects on crops, ecosystems and human health (IPCC 2007a, 2007b). Much of the climate burdens are falling on the poor and marginalized peoples in developing countries bringing to light attention as much on the disasters and impacts they face as on issues of rights and justice with respect to the allocation of resources as well as burdens and risks (Kates 2000; Thomas and Twyman 2005). This chapter draws on the context of the uplands of the Mekong region to highlight the interconnected dimensions of climatic risks and the rights of those affected by climate change and development, in particular social and political rights[i] as enshrined in the International Convention on Economic, Social and Cultural Rights. The uplands of the Mekong region within Montane Mainland Southeast Asia (MMSEA)[ii] comprise steep slopes and tectonic activities where natural hazards and risks are omnipresent. As a result of the seasonal shifts in monsoon weather patterns, a large part of upland Asia is exposed to increased annual floods and droughts (Bates et al, 2008). Climate change multiplies these risks. Available evidence shows that extreme fluctuations of climate such as rapid or sudden shifts in rainfall can result in either too much water causing loss of lives and property from flashfloods or too little water leading to drought, loss of crops and death of livestock (Xu et al, 2009). Climate impacts are often socially constructed (Ribot, 2009). Apart from climate-induced risks, various government development policies, institutional settings and expansion of regional, national and international markets have also placed upland peoples in a position of greater vulnerability. The rapid pace of regional economic integration has meant that previously subsistence-oriented livelihoods are quickly shifting towards a market-orientation, often at the encouragement of the government. New cash crops are accompanied by new forms of financial management for local people, and debt has become a major concern across the uplands. In this period of transition, the risk of natural disaster has compounded economic implications for local livelihoods. Response to climate change in terms of mitigation and adaptation can multiply risks as well. Structured measures for climate change adaptation such as embankments might redistribute flood risks (Lebel et al, 2007a) while hydropower development poses threats to river ecosystems and local livelihoods such as fisheries. Tree plantation projects, for instance, to earn carbon credits are taking away common lands and secondary forests used by upland communities (Adger et al, 2007; O’Brien et al, 2007). Douglas and Wildavsky (1982) define risk as a joint product of knowledge about the future and consent about the most desired prospects. Living with multiple risks, poor and marginalized groups must manage the costs and benefits of overlapping natural, social, political and economic hazards (Xu and Rana, 2005; Ribot, 2009). The rural poor have successfully faced threats linked to climate variability in the past in forms of mobility, storage and communal pooling of water and other natural resources, diversification, architecture and market exchange in rural settings as the basic mechanisms through which households address risks in securing livelihoods (Agrawal, 2009). The diversity of the Mekong uplands includes multiple livelihoods (from shifting cultivation in the humid tropics to nomadic herding on the high Tibetan plateau, from rice terraces to tea gardens), multiple ethnic cultures (more than fifty officially recognized ethnic nationalities and hundreds of linguistic groups), as well as numerous vulnerabilities (see Box 10.1). While the upland peoples in the Mekong region experience both threats and opportunities from climate change or development actions, many people, in particular the economically poorer, face disproportionate vulnerabilities in terms of loss of livelihoods and assets in the face of climate variability and global change (Sen, 1981). This situation is exacerbated by the fact that upland peoples are frequently blamed for environmental risks in downstream and coastal areas, despite the complex and still poorly understood causal linkages between change in the mountains and change in lowland areas. As will be discussed further below, policies to halt perceived environmental degradation in the uplands has often resulted in increased vulnerability for upland people, while the risks to lowland society remain unmitigated. Climate-related risks will have direct and indirect human rights impacts [iii]. Climate change is already undermining the realization of a broad range of internationally protected human rights: right to health and even life; right to food, water, shelter and property including access to natural resources; rights associated with livelihoods and culture; with migration and resettlement; and with personal security in the event of conflict (UNHCHR, 2009). Multiple climate and economic development-related risks impact on a range of rights including participation in decision-making (Molle et al, 2009). Climate impact analyses that links to human rights can prove useful in formulating detailed policy and research agendas to inform overarching climate change policy options (ICHRP, 2008), including strategies for mitigation and adaptation, and for particular ecological settings such as the uplands in the Mekong region. Adaptive management to global climate change can often lie beyond the capabilities of upland and indigenous people even though many communities are dealing with climate risks using their traditional and/or ecological knowledge systems. While recognizing that some groups are more resilient than others, the capabilities of local people and groups can be strengthened when appropriately assisted through partnerships with government and non-government organizations to ensure equitable access to resources and benefits. Yet low ‘capacity’ for adaptive management is often a product of constraints within the governance system of a country or region. Traditional ecological knowledge and environmental management practices are deeply rooted in local natural and cultural landscapes, but as upland areas are increasingly integrated into lowland social, economic and political systems, the pressures on indigenous and local knowledge increase. However, representation of upland people in national political processes is often constrained to varying degrees across the region. This means that what is perceived as a problem of many may actually be a problem of empowerment; thus the argument for inclusion of rights as a central component in considering risks from climate change. Our analysis of the climate risks in the Mekong uplands through a rights-based approach tries to address the climate-related vulnerabilities including both natural and human-induced hazards for the upland peoples, in particular for the poorest, in the Mekong region. The chapter’s intent is to bring together three threads that in the authors’ view are not adequately addressed in the climate change discourse: viz. uplands, poor/marginalized people and their disproportionate risks, and the human rights dimension. The risks-rights framework helps to better understand and address climate related risks and impacts in the uplands of the Mekong region and improve policies related to upland governance and climate change to benefit the poorer and marginalized peoples of the upland populations. Mapping geophysical hazards and socio-political constructed risks provides an entry point for concerted pro-poor climate change adaptation efforts. The chapter includes the following sections: The risks analysis of geophysical hazards and climate change in the Mekong uplands; Accelerated risks and socially constructed vulnerabilities; The value and challenges in a rights-based approach; The risks-rights nexus towards integrating rights for living with risks; Potential strategies and means to cope with, as well as rebound after, climate risks and disasters; Discussion and conclusions about improving and incorporating local rights as well as addressing the adaptive capacity of upland peoples to climate change. [ii] The Mekong uplands, lying within the larger context of Montane Mainland Southeast Asia (MMSEA), as defined in this chapter is a large, eco-region comprising about half of the land area of Cambodia, Laos, Burma/Myanmar, Thailand, Vietnam, and China’s Yunnan Province. The headwaters of the Yangtze, Salween, Irrawaddy, Mekong, Red, Chao Phraya and Pearl Rivers are located within the MMSEA region that drain an area of nearly 4 million km2 and have impacts on the lives of more than 696 million people (Xu and Thomas, 2010). The MMSEA region can be further divided into an alpine zone (above 3,000 masl), a high mountain zone (between 1000~3,000 masl), and a low mountain zone (between 300~1000 masl). The term “uplands” is used here to describe areas in the montane and alpine zones (Thomas et al, 2008). Our definition centers on areas that are between 300 to 3,000 metres above sea level (masl) in elevation, and located within and across several river basins. The alpine zone, which is dominated by the high altitude Tibetan Plateau, is referred to as the ‘Water Tower of Asia’ (Xu et al, 2008), while the montane zone has been called the ‘Roof of Southeast Asia’ (Thomas et al, 2008). [iii] Climate change will have implications for the enjoyment of human rights. The United Nations Human Rights Council recognized this in its “http://www2.ohchr.org/english/issues/climatechange/docs/Resolution_7_23.pdf&#8221; \t “_blank” resolution 7/23 “Human rights and climate change” (28 March 2008), expressing concern that climate change “poses an immediate and far-reaching threat to people and communities around the word” and requesting the Office of the United Nations High Commissioner to prepare a http://www2.ohchr.org/english/issues/climatechange/study.htm study on the relationship between climate change and human rights (“http://www2.ohchr.org/english/issues/climatechange/index.htm&#8221; http://www2.ohchr.org/english/issues/climatechange/index.htm, accessed 14 June 2010). Democratizing Water Governance in the Mekong Region. 2007. Lebel, L., Dore, J., Daniel, R., Koma, Y.S. (Eds.) Silkworm Books/Mekong Press, Chiang Mai. 284 pages. http://www.mekongpress.com/catalog/detail.php?isbn=9789749511251. Over the last few decades, the Mekong region has been facing complex pressures and challenges in water governance driven by a range of economic integration efforts and relationships motivated by national self-interest. 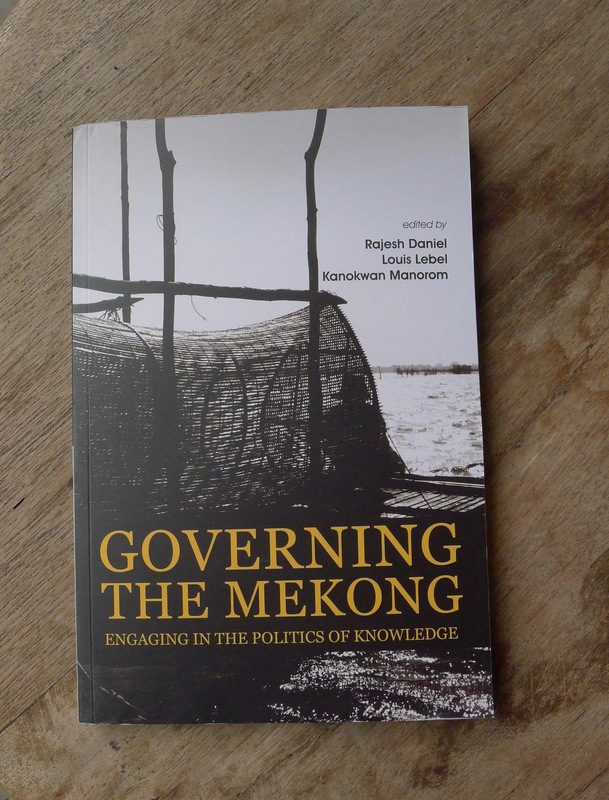 This book, the first in a four-volume series, brings together the work of researchers, scholars, activists, and leaders in the Mekong region to provide a baseline, state-of-knowledge review of the contemporary politics and discourses of water use, sharing, and management, and their implications for local livelihoods. The chapters critically analyze contested discourses on such topics as regional hydropower development, floods, and irrigation, along with the broader yet interrelated issues of gender, media, dialogue, and impact assessment. The writers explore the interplay of power relationships between actors such as state planners, regional institutions, the private sector, and various water users, in particular, politically marginalized groups including women, urban and rural poor, and ethnic peoples. The diverse array of topics and perspectives provides a sound basis for engaging in policy-related action. The book will appeal to a broad readership and, at the same time, contribute to the Mekong region’s search for democratic water governance options.